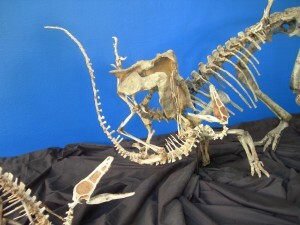 Our people have more than twenty years experience in molding and casting rare and delicate fossils. The highest quality silicones and resins capture the finest details of the fossils. After a multi-step hand-painting technique to match the original fossil, our replicas are virtually indistinguishable from the real thing. In addition, to producing fossil replicas of competitive quality, we offer custom molding services, in which we can make durable molds of your specimen. We also have decades of experience in fossil preparation, restoration, and mounting. From preparing gigantic, four-foot-long sauropod bones, to delicate micro-prepping and acid preparation techniques, we can handle virtually any fossil preparation job. Many time, we are the ones that take on fossil preparation jobs that few others could do, or that are rumored to be impossible; we usually always succeed. Our skilled sculptors are also scientists who have an in-depth knowledge of anatomy and paleontology. So, restorations are not only scientifically accurate, but also visually realistic, matching the texture of the rest of the fossil.